This fossilized ivory polar bear necklace combines both ancient walrus ivory and mammoth ivory in a design that evokes the symbolism and magic of the North. Our Bear with Fish fossilized mammoth ivory necklace also features fossilized walrus ivory for a complement of natural tones between these two ancient ivories. 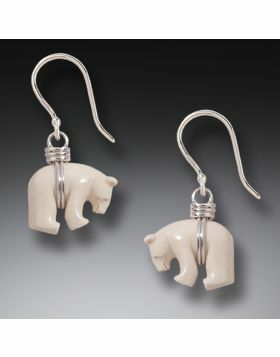 Its design is centered on polar bear and fish symbolism, or the grand circle of life that sustains us all. Native peoples have long valued the polar bear as a symbol of courage, fortitude, adaptability, and communication with Spirit. The polar bear is believed to have a pure spirit, exemplified in his pigment free fur that reflects available light back to the viewer in gorgeous white to creamy shades. Fish are a sub-primary part of the polar bear's diet, and he is an expert hunter. This carved ivory pendant creates the impression of abundance with its two fish poised above the bear in hand carved fossilized ivory and sterling silver detail. Unfortunately, the polar bear's current plight is far less optimistic. Climate change has led to a drastic reduction in time for hunting, thereby threatening the polar bear's chances of survival. The top fish is carved from fossilized walrus ivory, which is some 500 to 3,000 years old. Fossilized walrus ivory is an important part of indigenous Native economies, and it is prized worldwide for its ancient story and rare quality. This ivory has lain in the earth for centuries, accreting a range of soft caramel to deep cocoa hues. 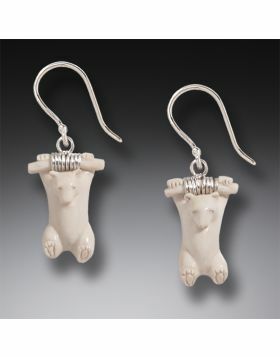 The bear in this ancient ivory polar bear necklace is artisan carved from fossilized mammoth ivory, a material that shares a now poignant connection with the polar bear. Mammoth ivory is an ancient ivory that has lain buried since the last of the great mammoths became extinct. Due to a vanishing ice cap and habitat loss, the polar bear is also facing the very real danger of extinction. The fossilized mammoth ivory's creamy tones make it an ideal and prized material for polar bear carvings, reminding us just how irrevocably we can lose an entire species to climate change.